Even if you’ve already done all your holiday shopping—and especially if you haven’t—a visit to one of these Christmas markets is the perfect seasonal activity. 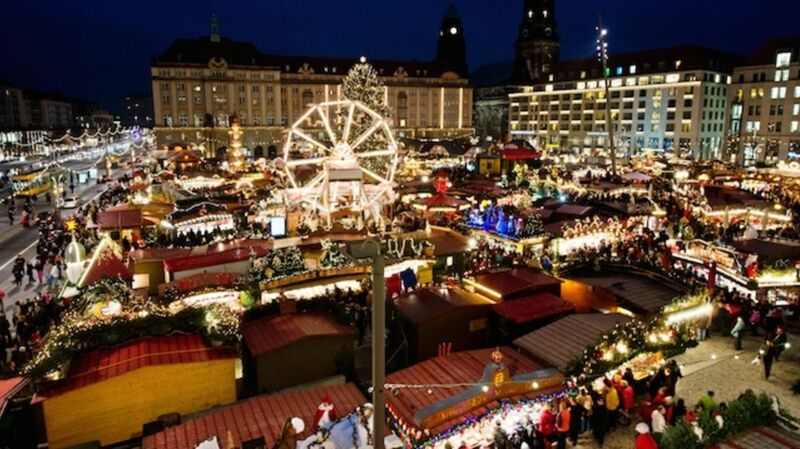 Now in its 581st year, Germany’s oldest Christmas Market welcomes over 2.5 million people to Altmarkt Square annually. It first opened as a meat market in 1434, but these days, the focus has shifted to bread. If you go, make sure to pick up a loaf of stollen or striezel, the fruit bread that gives the market its name, and check out the nearly 48-foot-tall Christmas pyramid. Britons with a taste for stollen don’t have to go to Germany to get their fix. Calling itself the "largest authentic German market outside of Germany and Austria,” the Frankfurt Christmas Market has brought traditional treats to central England for over a decade. But while the atmosphere is German, the stalls feature many gifts and crafts that are locally made. The self-proclaimed “Capital of Christmas” is home to a holiday market voted the best in Europe for the second straight year in 2015. The market dates back to 1570, when the first Christkindelsmärik (market of the Infant Jesus) was held. Each year, among the 300 stalls spread around 12 locations in the city, Strasbourg hosts a guest country; this year, the market will feature vendors from Luxembourg. A Bay Area tradition for 35 years, the Great Dickens Christmas Fair brings the spirit of Victorian London to San Francisco in the form of 120,000 square feet of music halls, pubs, dance floors, and shops. Costumes are encouraged, but not required. The famous amusement park gets an extra dose of cheer each holiday season thanks to 800,000 fairy lights and a Christmas market that has attracted over a million visitors annually since it first opened in 1994. Hungry shoppers can indulge in pickled herring, meatballs, cheese, rice pudding, and other dishes served as part of the traditional Danish julefrokost, or Christmas lunch. Arguably the most famous Christmas market in the world, Christkindlesmarkt welcomes close to two million visitors each year. The city prides itself on the market's history, which dates back to 1628. (Some of the wooden stalls are more than 100 years old.) The traditional food is one of the highlights of the market— Nürnberger lebkuchen (gingerbread), grilled sausages, and glühwein (mulled wine)—as are the 20 or so “sister cities” markets full of international wares. Vienna itself is practically one giant Christmas market from mid-November through the end of the year. Almost a dozen squares around the city host mini markets, each with its own distinct atmosphere. Rathausplatz, in front of the town hall, is the largest and most varied, and boasts a stunning carousel for visiting families. The Christmas village in the Old AKH has two curling lanes set up amid the shopping, while the winter market on Riesenradplatz features live entertainment all month. Home to the largest outdoor ice skating rink in the United Kingdom, this winter wonderland is more than just a Christmas market. There’s a Santa handing out presents, impressive ice sculptures, a circus show, as well as a Bavarian-style village where you can find traditional food and gift offerings. Estonia’s capital—which some say was home to the world's first Christmas tree—features a popular Christmas market, generally held in the city's medieval Town Square. There, you can sample traditional Estonian fare like blood pudding, take in the ice sculptures, and enjoy performances by singers and dancers from all across Estonia. There’s even a mini-zoo featuring rabbits, goats, lambs, ponies, and more. What originated as a feast for St. Llúcia in the 1700s has morphed into a three-week-long Christmas market that specializes in seasonal items like Christmas trees, poinsettias, and nativity scenes featuring cheeky Catalan caganer figurines. Whereas most Christmas markets serve Bavarian food, everything dished up here is classic Spanish fare.